Because I'm all about the base.. I'm always trying, testing and experimenting with different bases for different faces. Everyone wants a flawless face for a special occasion, so here are some of my kit staples. I use Urban Decay All Nighter for a super heavy coverage. It glides on but doesn't sit heavily on the skin. You do have to be aware of some oxidation though (the product can get slightly darker once it settles). I tend to use a damp sponge or fluffy buffing brush for application. High Defintion Foundation is another full coverage staple. I often mix it with MAQPRO Makeup Mixer for a sheerer finish. This allows me to use it to full effect or I can blend it right down to give a tinted dewy look. This is a good tip for making your foundation lighter for a more subtle daytime look or for mature skin types that suit a glossier finish. I couldn't be without this versatile base. Temptu Hydra Lock is my airbrush Foundation. It's hydrating, long-wearing and has anti-aging benefits. It's my go to, to finish off a look enabling me to correct any small imperfections. No.7 Lift & Luminate is a new addition to my kit. I fell in love with this base after a mob (mother-of-the-bride) asked me to use it at a recent wedding booking. This lovely lady had incredibly dry skin and rosacea to boot. She had been an Estée Lauder Double Wear addict as she liked to cover her very red cheeks and broken capillaries. She was recommended this product by a friend and I have to agree - it offers great coverage, but at the same time blurs large pores and fine lines - making it perfect for drier skin types. My verdict - so far, so good. My RCMA palette is my other base of choice. I use it to mix and match to correct different skin tones and add depth and light to enhance face shapes. It's a great product, but probably more of a professional kit essential. In my image are Makeup Forever's correction concealers scraped into the bottom of the palette. I spotted them in TK Maxx this week for a bargain price. These highly pigmented concealers are perfect for covering dark spots and other skin blemishes. 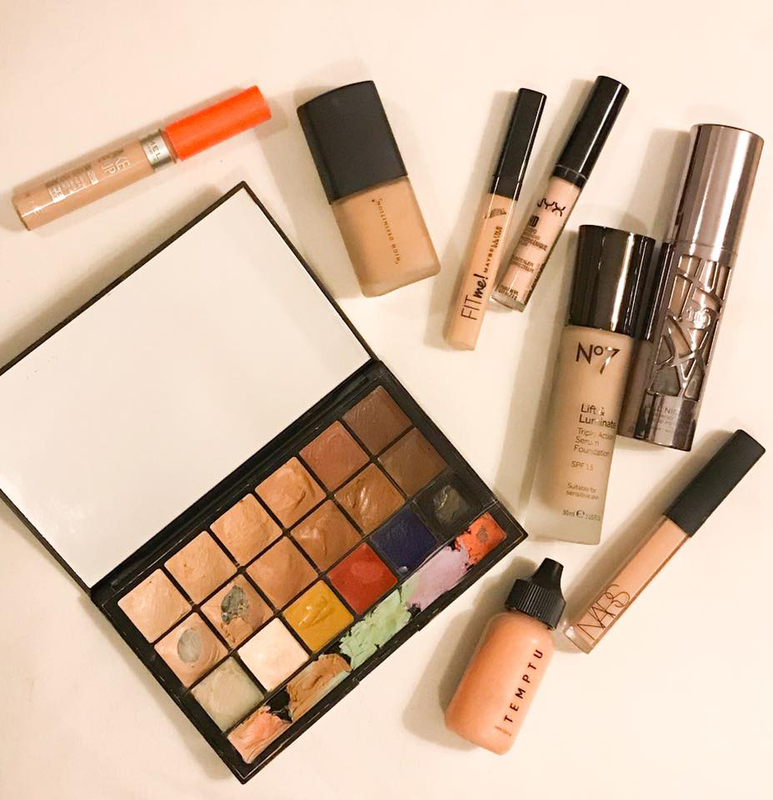 I'm also in the process of experimenting with concealers - Nars, NYX, Maybelline and Rimmel. I hate when they settle into fine lines around the eyes so often add a small amount of eye primer before applying and buffing it in with a small fluffy brush. Please do let me know what your favourite brands are and why on my instagram..